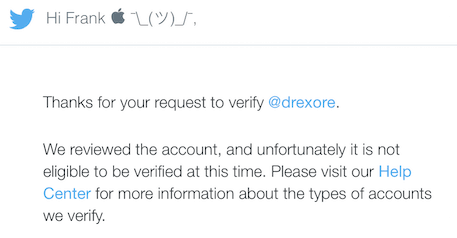 Just because it is possible I tried to get my twitter account @drexore verified. I submitted the request for verification on August 25th, 2016. Ans so the waiting started. I don’t really expect to my account to get the verified badge ( ), but who knows maybe I get lucky . I sort of expected to receive a DM or an email to the linked address, but nothing at all… The only way to get the status of your request (at least so it appears) is to perform the first steps of the verification request again.